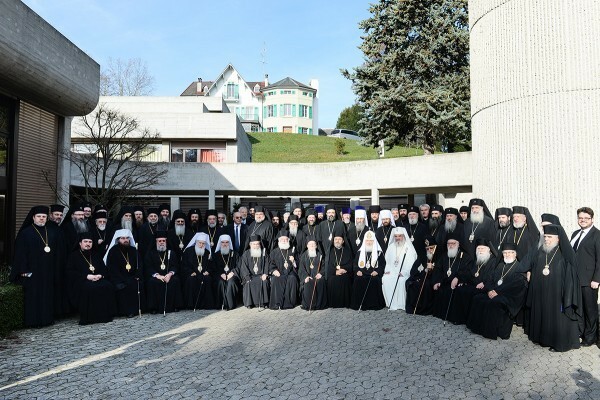 The Synaxis of Primates of the Local Orthodox Churches took place at the Orthodox Centre of the Ecumenical Patriarchate in Chambésy near Geneva, Switzerland, from January 21 to 28, 2016. Attending the Synaxis were His Holiness Patriarch Bartholomew of Constantinople, His Beatitude Patriarch Theodoros II of Alexandria and All Africa, His Beatitude Patriarch Theophilos III of Jerusalem and All Palestine, His Holiness Patriarch Kirill of Moscow and All Russia, His Holiness and Beatitude Catholicos-Patriarch Iliya II of All Georgia, His Holiness Patriarch Irinej of Serbia, His Beatitude Patriarch Daniel of Romania, His Holiness Patriarch Neofit of Bulgaria, His Beatitude Archbishop Chrysostomos II of Cyprus, His Beatitude Archbishop Anastasios of Tirana and All Albania, and His Beatitude Metropolitan Rastislav of the Czech Lands and Slovakia. His Beatitude Patriarch John X of Antioch and All the East, His Beatitude Metropolitan Sava of Warsaw and All Poland, and His Beatitude Archbishop Ienonymos II of Athens and All Greece were represented by official delegations of their Churches. The Primates and heads of the delegations of Orthodox Churches, except the Church of Antioch, celebrated Divine Liturgy at the stavropegic Church of St Paul on January 24. The Primates confirmed their decision to convene the Holy and Great Council of the Orthodox Church and resolved to hold it at the Orthodox Academy of Crete in Hania, Greece, from June 16 to 27, 2016. The draft document ‘The Mission of the Orthodox Church in the Modern World” with amendments and corrections was approved unanimously for presenting it at the Council. The Council’s draft decision on “The Sacrament of Marriage and Impediments to it” was signed by all heads of the delegations of the Local Orthodox Churches, except the Churches of Georgia and Antioch. The head of the Church of Antioch’s delegation expressed his disagreement with the document in the written form. The delegation of the Church of Antioch has not agreed with the Council’s Rules of Procedure which was signed by all other delegations to the Synaxis. Also introduced for consideration by the Council were the following topics: Orthodox Diaspora; Autonomy and the Method of its Proclamation; The Meaning of Fast and its Observance Today; The Orthodox Church’s Relations with the Rest of the Christian World”. The Synaxis of the Primates resolved to publish all the approved texts. The Primates also discussed and took decisions of the establishment of the Pan-Orthodox Secretariat, participation of the non-Orthodox observers at the opening and concluding sessions of the Council, and on common expense coverage of the Council. The Primates expressed their support to the persecuted Christians in the Middle East and their unceasing concern over the abduction of Metropolitans Paul (Yazigi) from the Patriarchate of Antioch and Gregorios Yohanna Ibrahim from the Syriac Orthodox Church. The Synaxis completed its work in the evening of 27 February 2016 by the concluding words of its chairman, His Holiness Patriarch Bartholomew of Constantinople. The meeting being over, the Russian Orthodox Church’s delegation headed by His Holiness Patriarch Kirill of Moscow and All Russia departed for homeland. The delegation included His Beatitude Metropolitan Onufry of Kiev and All Ukraine; Metropolitan Hilarion of Volokolamsk, chairman of the Moscow Patriarchate’s Department for External Church Relations (DECR); and archpriest Nikolai Balashov, DECR deputy chairman. An exchange of opinions on the issues raised in the addresses followed. His Holiness Patriarch Bartholomew of Constantinople hailed the presence of His Beatitude Metropolitan Onufty of Kiev and Ukraine, whom, as His Holiness noted, all Orthodox Churches recognize as the only canonical First Hierarch of the Ukrainian Orthodox Church. To conclude the first day of the Synaxis, its participants established the Regulations Commission and the Drafting Commission for the Preparation of the Final Document of the Synaxis.